However, here is a peek at what I have been working on. I combined a 6x6 Album in Acetate and a 6x6 Album in Chipboard to create this one. I also chose to use patterned paper from the DCWV Nonsense Line. The notebook-looking paper is from Making Memories. For the page on the right, I used a Tag Pocket Card with Tag. On the fold-down flap of the tag pocket, I used my Fiskars border punch to add some pizazz. Before adhering the pocket together I used an EK Success Whale of a Punch (circle) to punch a hole on the bottom left of the front of the pocket. On the tag that is inserted in the pocket, I punched a flower with my Fiskars punch and adhered it so it can be seen through the hole. To add some pattern, I used a stamp from Prickley Pear Rubber Stamps to stamp the library pocket (front and back) and the insert tag. I outlined the stamped image with a Gelly Roll clear marker to give it just a hint of bling. This is a view of the back side of that Tag Pocket Card. I not only stamped it with a floral/flourish in Versamark ink, I also stamped a butterfly (yep...from Prickley Pear Rubber Stamps) and a small crown image and colored the image in using Stardust Gelly Roll markers. The sentiment is from a rub-on set by Me and My Big Ideas. The page on the right was done on one of the chipboard pages. 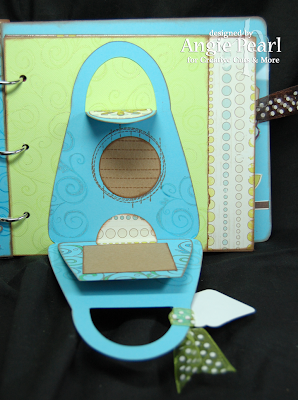 I added a Purse A2 Card with Layer die cut from Creative Cuts and More. It's a darling little purse and you can get it with a little tag that can be inserted in the middle. (see picture below) I wanted another little place to "hide" photos and journaling, so I adhered it to the page and it flips open. 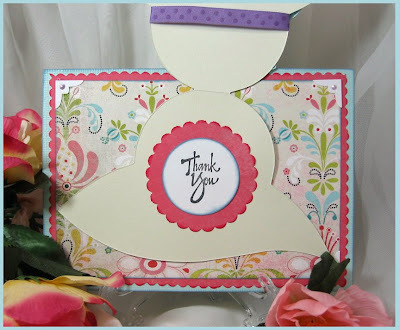 The flourish stamp is from Stampendous and the flower is a Fiskars punch. For the last page I have to show you, I used a cute little Coin Purse Card with Clasps. I adhered a small mat and stamped a journaling block. (stamp from Autumn Leaves) I then made a pocket on the chipboard covered album page and that made a place to insert it to keep it in it's place on the page. It just slips out so it can be opened to look at. Thanks for stopping in and I hope you enjoyed the peek at my newest creation! How's everything in your bowl? Note: the inside sentiment and the fish stamp had words and text so to only stamp the part I wanted I colored the desired image with a black brush tip marker and stamped, It's a great way to get more stamp for your money! Jennifer Beason, that's hoo! 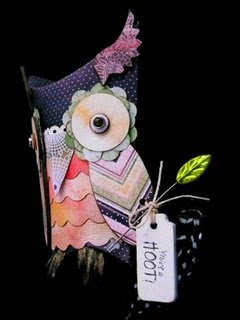 She took the CC&M Short Puff Box and made the cutest little owl imaginable! Tools - Scalloped border punch and circle punches. First, cover front and the top of the puff box with the black polka dotted paper. Use a scallop punch and cut four strips of patterned paper about four inches long. Glue the scalloped strips to the box starting near the bottom and working upward. Cover the 2 large photo turns with patterned paper. Then use a small circle punch to cut circles to go around the round part of each photo turn. 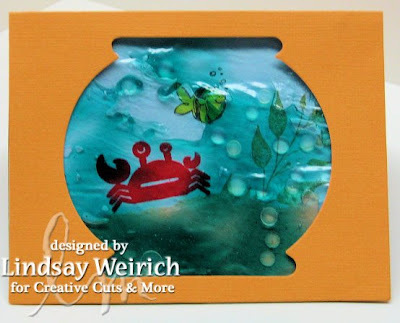 Use a punch to cut 2, 1 inch circles out of patterned paper, then adhere them to the photo turn. 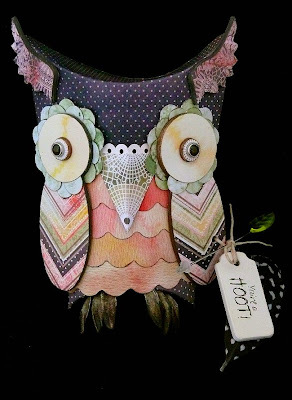 Embellish the eyes with some chipboard circles and brads and attach them to the box. Cover the chipboard wings with patterned paper then adhere them to the box for the ears. Cut apart a flower to create the claws of the owl. (I used three petals for each one.) 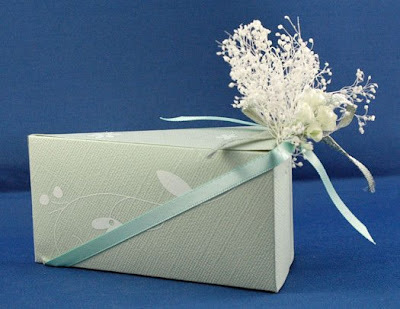 Glue the petals to the bottom of the box. To finish off the box, I printed out my sentiment then adhered it to a mini tag, tied the tag to the box with some twine then added a stick pin and a feather to embellish. This is definitely an example of an out-of-the-box box, isn't it? Great work, Jenni! Megan Peacock is at it again! 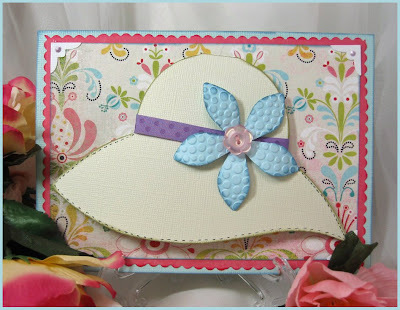 Take a look at this fun twist on the CC&M Exclusive Hat Card... she mounted it to a 5x7 piece of cardstock decorated with patterned paper. Pretty cool! As you can see, the hat is adorned with a pretty blue Flower #6 die cut. She added texture to the flower with a Cuttlebug embossing folder. This project feels like Spring, doesn't it? 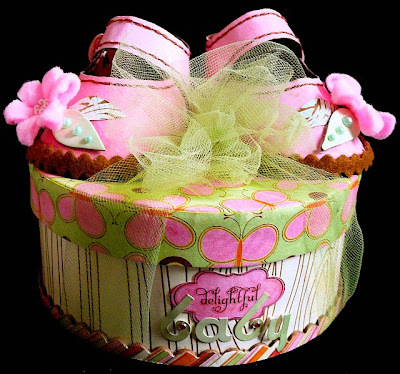 What a fun first project for us to feature from March 2009 guest designer Jennifer Beason! She started with the Baby Shoe die and went to town! 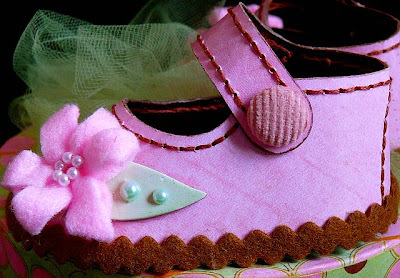 These shoes are so well-decorated, they look real! See the seam stitching and the corduroy brads? We're in love! And, perhaps the best part? She used them atop a very pretty gift box! Great job, Jennifer! We can't wait to see what else you have in store for us this month! 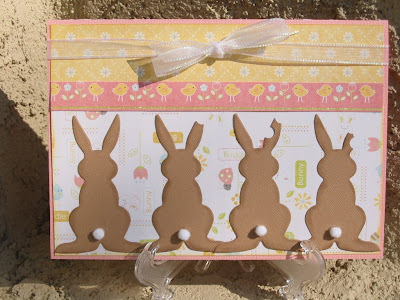 Oh what a cute idea for Easter from Megan Peacock, another of our talented guest designers. She used multiples of the adorable Rabbit die to indicate chocolate bunnies being eaten ears-first. Isn't she clever? Those little pom-pom tails are the perfect touch! The Creative Cuts and More Design Team had a fantastic time showing you all of our "wedding" themed projects during our first ever blog hop. Hopefully we have inspired you to create some stunning projects of your own. 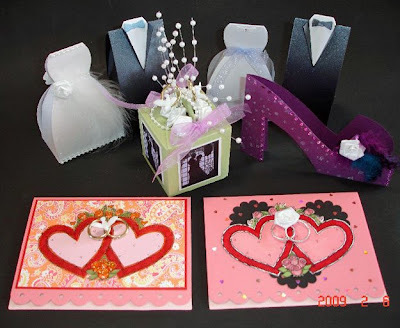 NOW for our "March Customer Challenge", we would like you to run with our "Love/Wedding" theme and show us all of the fabulous creations you can make with the die cuts from Creative Cuts and More. You will have plenty of time to order from the Creative Cuts and More online store, design and post your projects to your own blog or gallery. Please, don't forget to leave your link here on this post. The deadline is April 15, 2009 11:59PM MDT! Now you are probably wondering...is there a prize...YES three prizes!! All three winners will be able to use their gift certificates towards any of the many products on the Creative Cuts and More website. What are you waiting for... click on over to Creative Cuts and More and get your Diecut Diva groove on! Thank you so much to our Design Team and to all our Blog Hoppers for making our first-ever Blog Hop such a huge success! We couldn't have done it without you. Ok, this was fun. I have never done a blog hop before. 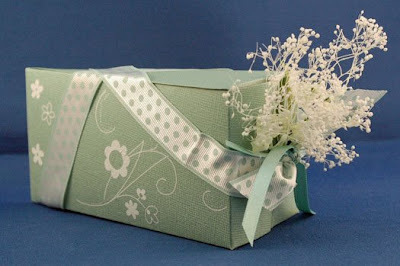 I loved everyone's ideas and different ways they did the wedding dress boxes. My favorite thing I saw, had to be on the last blog with the red and white cake boxes. I loved the colors, the way there were alternating, and two layers of them. What a fun way to decorate for any type of party....adorable, usable, and giveawayble (if that is a word! LOL). Heidi, please send us a quick message with your e-mail address so we can issue your prize. Thanks again everyone! Stay tuned for more great samples! Blog Hop & New Dies! Welcome to our first ever BLOG HOP! At the end of this post, we'll describe our hop and tell you how you can win blog candy at each blog in the hop! We're so excited to show you all the fun projects we've been creating with love & weddings in mind -- and it's been even more fun because we have four new dies to show off: Dress Box, Tuxedo Box, Chair Box, and A2 Scalloped Border Card. Here are Deb McNett's interpretation of the Dress Box which she had cut from Crystal White Stardream Metallic Cardstock and covered with lace, and the Tuxedo Box cut from Onyx Stardream Metallic Cardstock. Next up is an entirely different take on the same two boxes from Andrea Ruccolo. Her Dress Box is cut from Ice Gold Curious Metallic Cardstock and Tuxedo Box is cut from Onyx Stardream Metallic Cardstock. This wonderful ensemble of wedding items was created by Judy DiScipio. What creative ideas! In addition to favors, she created some beautiful cards. One card is the Creative Cuts & More exclusive Shoe Card. Our next samples are cake slices created by Kat Salmon, cut from Aqua Bazzill and Lagoon Bazzill respectively. Next we have two fun samples from Deb Oberg, who served as a Guest Designer during the month of February. 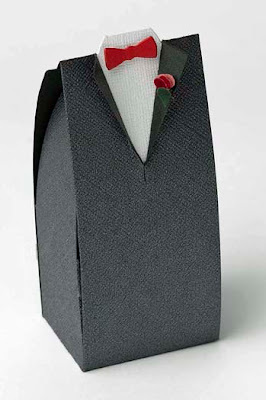 Her Tuxedo Box was cut from Black Tie Bazzill Bling. 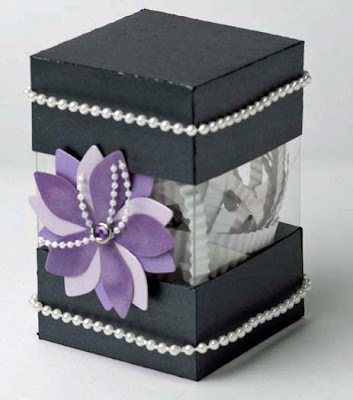 And this favor box from Deb is one of our exclusives, the Peek-a-View Box cut from Anthracite Stardream Metallic paper. It is adorned with Flower #6 Small cut from Kunzite & Amethyst Stardream Metallics and Lavender Velvet paper. Beautiful! We hope you've enjoyed looking at these samples! We have even more for you! Each of our blogging DT members have additional samples posted on their blogs now, and they're each offering BLOG CANDY! Start here at Hop #1 with Angie Pearl. At the end of the hop, Pam will direct you back here for the chance to win one more prize. Leave a comment on this post with the name of your favorite new die or your favorite project you saw during today's blog hop. Entries will be accepted through 11:59PM Mountain Time on Thursday, March 5th and the winner of a $15 gift certificate to Creative Cuts & More will be posted the following day. Now that you've seen all of our wedding-inspired projects, we'd like to see yours! Check back later in the week for details on our upcoming customer challenge. Thank you & Happy Hopping!